Susan Howell Evans began her organ career as a pupil at Christ’s Hospital, Hertford and, as a young girl, played organ at churches around Hertfordshire where her father served as priest. She began her professional training at Trinity College, London reading a degree in music. Her musical heritage at St George’s began soon after she took up post on Sunday May 25th 1973 under Fr Garth Colin. Susan has been Musical Director and Organist at St George’s Church for forty years. She has seen off four Rectors (that she can recall) and outlived one organ. Susan has been an inspiration to many young people, teaching music at Prebendal School, Westbourne House, Bishop Luffa and most recently as private tutor and teacher at Lavant House School. Susan was awarded a Fellowship of the Guild of Musicians and Singers in 1985. 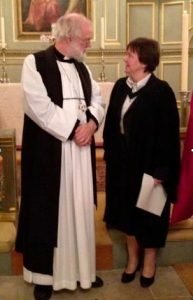 In 2003 she was awarded the ARSCM (Associate of the Royal School of Church Music) for her services as tutor on residential courses, and most recently made an honorary member of the Guild of Church Musicians (2012).In between directing the Parish Choir, the Score, performing in local choirs, and teaching, she sometimes finds time for walking the dog, enjoying the company of her three grown up children and developing her appreciation of fine wine. Occasionally she does something silly like leap out of a plane for St George’s skydiving team, raising over £1500 towards the organ she now delights in playing every Sunday.